Laurie Gregory has worked in the beauty industry, developing thousands of products for big retailers. “You probably have some in your bathroom or your cosmetic bag a product that I have helped create,” teases Gregory. As a life long seeker of inspiration & beauty, Gregory has always been inspired by soulful places & ritual: yoga, puja, spiritual practices, reiki, meditation, and sacred spaces. She’s a beauty industry executive by day, and a spiritual Shaman by night. Two years ago, Gregory was feeling a need to combine the best of beauty with spirituality. 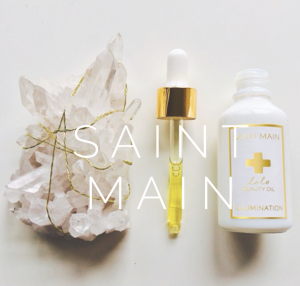 And with that, she founded SAINT MAIN, offering ritualistic beauty oils and candles with crystals inside of them. 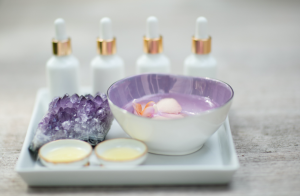 “I created Saint Main as I saw a need for products that were completely natural and blended with spirituality and healing energy,” shares Gregory. Saint main is inspired by Gregory’s mother’s family name, which originates in France. “When one of the St. Manes walked into the room, they radiated an aura around them of beauty, charisma, and a magical twinkle of the eye,” recalls Gregory. Gregory has always loved the name and loved the meaning behind it. “The definition of a SAINT is a person who has a high degree of holiness, and I believe all women are divinely holy,” she explains. Which is why SAINT MAIN is a celebration of women honoring the divine within themselves. “When you become connected to your holiness thru the power of sacred ritual you become more beautiful, more radiant, and glow from within,” extols Gregory. SAINT MAIN products are curated from the highest quality of ethically sourced ingredients from around the world. The products are blended with alchemy and, according to Gregory, smell heavenly. “Unlike a lot of the natural products on the market which honestly smell really bad,” she says. During production, each product is blessed by a Shaman for the highest vibrational energy. Plus each product comes with a ceremonial ritual and blessings to release your inner beauty and godliness from within. 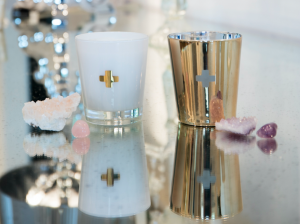 Gregory says her customers love the SAINT MAIN candles, which are blended with essential oils and smell heavenly. She explains how a crystal – which has been blessed – is lovingly placed inside. Like a rose quartz crystal symbolizing love and an amethyst crystal to enhance creativity, intuition, and spiritual wellbeing. “As the candle burns, the crystals’ healing energy embraces you with its magic and blessings. After you burn the candle, the crystal can be placed in your wallet or in your sacred space as a token of healing,” Gregory shares. Another favorite product is The DEVOTION beauty oil. 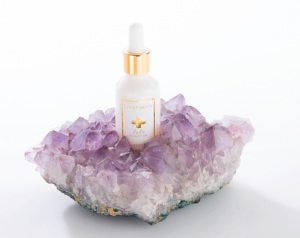 DEVOTION is an all natural, skin-loving blend of six precious beauty oils and sacred essential oils known for their amazing healing and beauty benefits. Gregory goes on to explain how its Rose Absolute inspires loving thoughts and glowing skin, Frankincense (the holiest of oils) awakens spiritual awareness, and Geranium promotes balance and harmony. “We devote this oil to your beautiful soul … love, cherish and adore yourself,” says Gregory. Gregory shares that, as women, we all aspire to embody three attributes: beautiful, radiant, glowing from within. For her, the “beauty” world has taught us that to feel beautiful you must look beautiful. “So as women, we lay awake at night ruminating over our to-do lists and obsessing over the wrinkles we see creeping into our faces,” says Gregory. “Being in the beauty industry for 20 years, I’ve been part of this marketing that teaches us that if you look beautiful, you feel beautiful,” recalls Gregory. “But intuitively we know that not to be true. Behind the perfect photos posted on social media or in the beauty ads are women who feel depressed, anxious, and not good enough,” she says. For Gregory, with SAINT MAIN, she’s guiding women who’re seeing glimpses of their outer beauty fading and helping them to feel beautiful. “Because when you feel beautiful is when you truly glow,” she shares. “By adding spirituality to their beauty routine and ritual, the more spiritual you become, the younger and more beautiful you become. You glow and infuse luminosity and love,” Gregory shares. Learn more about Laurie Gregory and SAINT MAIN by visiting online at www.saintmain.com. And follow on Instagram: @saint_main.